Rabbits are a prey species. They are ground (and subterranean) dwelling. In the wild the only time they would be picked up would be if they were about to become a predator’s dinner. Our own pet rabbits can find this just as alarming, because fear of being lifted is hardwired into their genes. So, how can we handle rabbits in a way that won’t frighten them, and won’t cause any injury? We need to do it so we can examine bottoms, cut nails, groom, give medicines and tend to any injuries. Rabbits that are panicked by being held may struggle and hurt their backs or legs, or they may leap to the ground and hurt themselves when they land. Rabbits that have been handled from a very young age are often more confident and will sit quietly in our arms, without struggling or panicking. Don’t let your guard down though. Although they may seem calm, they can be unpredictable, and they might suddenly leap out of your arms if you aren’t holding them properly. If you’re starting off with a nervous rabbit that hasn’t been handled much in the past, you need to build its confidence in you and start off by letting them come to you. Hand feeding is a good reward and they may allow you to stroke them quite quickly. Take it at a pace they’re comfortable with until you can touch them all over without them panicking before you ever try to lift him up. When you do lift them, they needs to be and to feel secure. You may need to start by putting a hand over their shoulders to keep them steady. Then put one hand under their chest, with a couple of your fingers between their front legs, the other two around the outside of one leg and your thumb around the outside of the other. With your other hand scoop up their bottom. Get them very close to your body as quickly as you can so that they’re secure and cannot wriggle nor leap out of your grip. Don’t squeeze. Rabbits are very fragile, with fine bones that snap easily and internal organs that can easily be damaged. You need to be firm without squeezing. When putting your rabbit back on the ground, you need to be careful that they doesn’t make a jump for freedom. Keep them as close to your body as you can, bend your knees and squat down, and lower your rabbit to the ground still in your secure grip. Put them down gently and if they don’t run off straight away, give them a head scratch so that they will know you’re still their best friend and you love them. Let that positive reward be what they remember about the experience. We do not recommend scruffing. It should not be needed in the vast majority of cases. 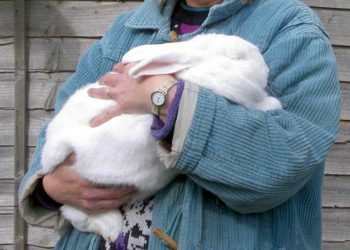 A very scared, possibly uncooperative rabbit that must be handled for injections for example, may have the scruff held but their weight should be taken by a hand underneath their bottom, and if scruffing can be avoided while still keeping the rabbit safe, proper handling will leave your rabbit unharmed and far less traumatised. NEVER LIFT RABBITS BY THE EARS. We cannot stress this strongly enough. There is no need for it, and no excuse. It’s wrong, plain and simple. Some people will hold their rabbit on its back so it goes perfectly still as if in a trance. This is in fact extremely cruel as the rabbit is, in fact, terrified and playing dead as part of its prey animal response to being caught by a predator. Never do this to your rabbits.